Wind power is one of the renewable energy sources. Wind power can be harnessed and used to produce electricity. Electric vehicles are vehicles which use electricity as their fuel instead of the ordinary cars which use petrol or other fossil fuels. Electric cars need charging, they need to be plugged in to get charged. Electric cars are green and friendly to the environment since they do not emit carbon dioxide. All these efforts enable us to save energy and have a clean environment. Think of the combination and the innovation. Wind turbines produce electricity and this electricity is used to charge electric cars. A perfect and virtuous cycle which lead to a wind- powered charging station for electric cars developed by the New York based Urban Green Energy and General Electric, GE, Energy. We all understand that there is virtually no limitation as to the way wind as a renewable green energy is exploited to produce useful clean energy which can be used in a number of applications and installations. The Sanya Skypump is the name of the new and innovative wind-power electric-vehicle station. This new innovative idea has become a reality and the first installation was completed in Barcelona at the headquarters of a waste management group called Cespa. The wind turbine is a vertical GE 4KW wind turbine capable of capturing the wind in the area and delivering 4KW of clean renewable electricity. 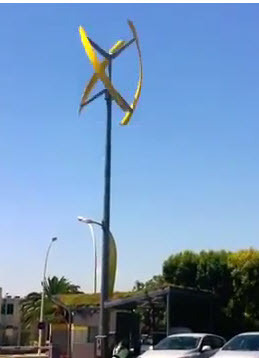 This wind turbine uses the dual axis technology, DAT, which enables the turbine to use both the vertical and horizontal forces to produce electricity. The electricity is stored and at the base of the wind turbine that are charging positions with touch screen instructions as to how the charging is done. When there is no charging need the electricity produced is delivered to the grid to which the whole system is connected. The Sanya Skypump is a wind turbine which has been designed for easy and quick assembly, it takes just 2 hours to assembly it, and it is intended to be used virtually anywhere. Parking lots are ideal since cars can be charged while they are parked and the owner is busy doing something else like shopping. Rest areas on highways are also another well suited place since users of electric cars will need refuelling. In these areas there should be adequate wind to produce electricity. This is another innovation which saves energy and used RES.